Remember how much fun it was to play with forts when you were a kid? Regardless of whether you grew up in the city or the suburbs, you no doubt found ways to use the resources around to build your own private little escape. Well, August Graube, founder of Fort Boards, wanted to recreate that excitement and instill that same sort of passion and imagination for kids today. The only problem? No one made a fort-building kit the way he envisioned it. So began his journey with Fort Boards. Click play below to listen to my interview with August and keep reading below for more. As Graube explained, designing a physical good is much more challenging and cost-intensive than designing a software product. You cannot just roll out different versions and hope customers appreciate the latest updates. On the contrary, when you are dealing in physical goods, you have to nail that design down before you can do anything else. 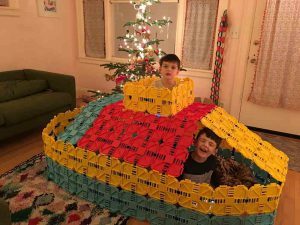 Graube knew exactly what he wanted to create: a fort-building kit that would resemble an oversized Lego set, something kids could use to build a variety of forts, boats, ships, animals, etc. He wanted the creations to be large enough for kids to crawl inside of and play within. But these large pieces proved to be difficult to design in the four months Graube predicted it would take. Instead, it ended up taking three years and 165 designs! 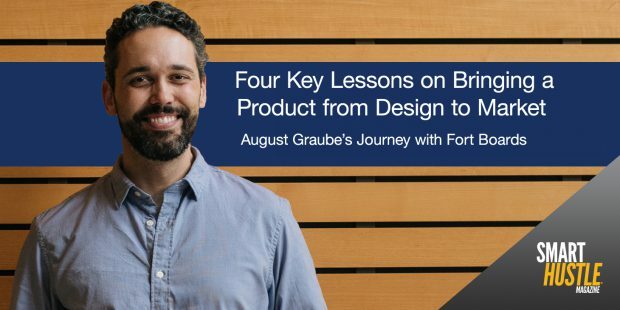 Graube’s careful approach to finding the right-fit manufacturer took him on two intensive journeys. The first consisted of a five-day road trip and 1,300 miles traveling between Washington, D.C., and Chicago. He met with five different vendors, learned about the manufacturing process, and found a manufacturer that Fort Boards ended up partnering with. The only problem? "Toy industry margins are slim and competitive." Because of this, it meant he could not afford to sell his product to certain third-party resellers for a reasonable price and still make a profit. So, he decided to move manufacturing overseas. That dedication to perfection resulted in a retooling that scrapped his original $2,000 investment and turned it into a $20,000 investment. Bringing your #businessproduct from #design to #market. A Journey for August Graube of @FortBoards. Initially, Graube approached the design process with the customer in mind. However, he had not given much thought to the sales channels where the product would be sold. "We were chasing after the wrong sales channels for a long time... The retail shelves at Toys 'R' Us and Target were not the best fit for us." Once Graube sorted out what made sense regarding sales, Fort Boards found their groove in marketing. They focus a lot on social media as well as email blasts. Moreover, they try to add humor to all their marketing efforts. Graube recognizes that there’s already an interest in forts and that customers do not need to be sold on them, which allows them to focus more on making strong customer connections. Watch their award-winning video below.